Jarte's ruler provides a means of document measurement as well as a convenient means of setting tab stops. The ruler's zero position represents the left edge of the document text (i.e., the ruler does not include the left side print margin). The ruler's units can be switched between metric units and English units by right clicking on the ruler and setting the Metric check box appropriately. The ruler can not used to set page margins. See Page Margins instead. Tab stops are useful for aligning text using the Tab key. A tab stop can be set by simply clicking on the ruler at the point where the tab stop is to be positioned. A tab stop can be moved by dragging it with the mouse to the desired new position. A tab stop can be removed by dragging it off of the ruler. Tab stops are an attribute of paragraph formatting. When you set a tab stop it applies only to the paragraph containing the current position of the text cursor. If you want to set a tab stop for multiple paragraphs, or the entire document, you must first select (highlight) the paragraphs for which the tab stop is to be applied. Normal (Left) Tab Stop ( ) - Text entered at a left tab stop flows to the right, as normal. This is the default tab stop type. Right Tab Stop ( ) - Text entered at a right tab stop flows to the left keeping the end of the text at the tab stop. Center Tab Stop ( ) - Text entered at a center tab stop flows right and left such that the center of the text remains positioned at the tab stop. Decimal Tab Stop ( ) - A decimal entered at a decimal tab stop remains positioned at the tab stop. Text entered before the decimal flows to the left of the tab stop. Text entered after the decimal flow to the right of the tab stop. Decimal tab stops are useful for aligning columns of numbers containing decimals, particularly monetary figures. 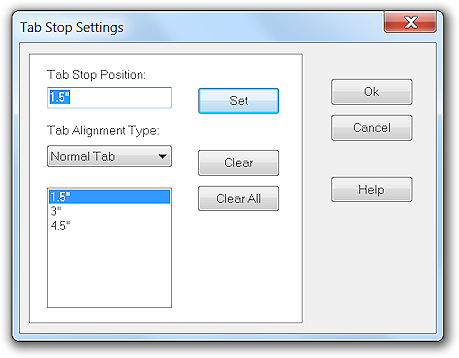 The desired tab stop type may be selected from the Ruler's Options menu before setting the tab stop. An alternative means of setting tab stops is to use the Tab Stops window. Right click on the ruler and choose Tab Settings. Create a tab stop by entering its position in the Tab Stop Position box, selecting the Tab Alignment Type, and then clicking the Set button. The new tab stop is added to list of defined tab stops. A tab stop can be removed from the tab stop list by selecting it with mouse and clicking the Clear button. Use Clear All to clear all of the tab stops in the tab stop list.